Montblanc Lucky Orange is a limited edition ink from 2017. I got my bottle from Anderson Pens. This ink is made in Austria. So let's talk about the bottle; I am in love with this bottle. 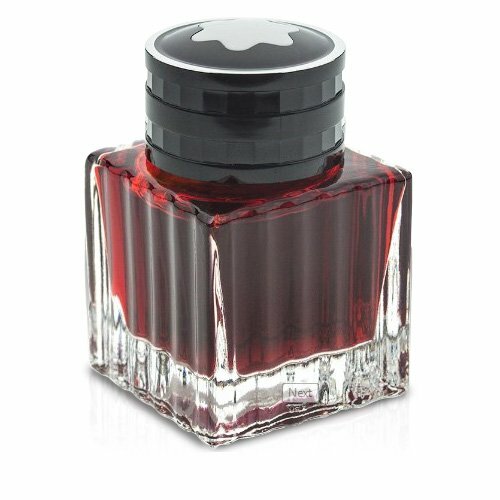 I wish all fountain pen ink bottles looked like this. The bottle is glass and has a nice weight to it. I love the Montblanc logo on the top. It says a lot about a product when even the bottom of the bottle is gorgeous. I love the details in the glass. The ink is a bright red-orange. I love coordinating my ink colors by season and this would be a great fall orange. It reminds me of Halloween. This shows Montblanc Lucky Orange on Rhodia paper. The left shows the minimal ghosting with no bleed through. There is no feathering and no sheen. I didn't see much if any shading on this paper. This is Lucky Orange on Tomoe River paper (Nanami Crossfield notebook). There is lots of ghosting, but no actual bleed through. It comes really close to bleeding through on the bottom swab though. The ink appears darker than it does on the Rhodia. This shows Lucky Orange on Leuchtturm 1917 paper. The ink bled through in a few spots on the bottom swatch, but only showed ghosting in the actual writing. This is Lucky Orange on Baron Fig Confidant paper, and holy hannah can you say bleed through?? There was lots of feathering and bleeding. Even the extra fine nib writing bled through, as shown below. I even loved how the ink looked on the paper towel when I was inking the pens up. It's just a gorgeous red orange. When you stack up the four notebooks you can really see the difference in swab color. Top to bottom, are: Baron Fig Confidant, Rhodia Web notebook, Leuchtturm 1917 notebook, and the Nanami Crossfield. The Baron Fig Confidant just makes the color look lighter and washed out. Lucky Orange is closest to Pilot Iroshizuku Fuyu-gaki. 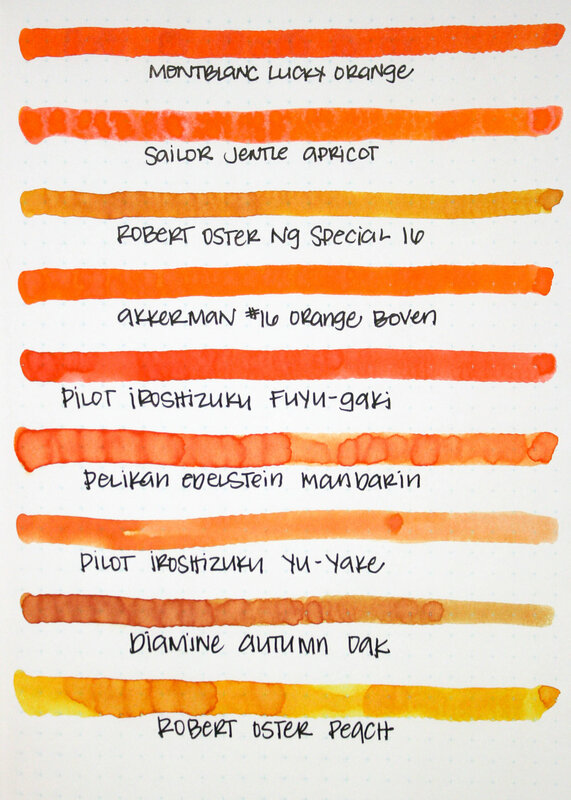 The Sailor Jentle Apricot is a little too light, and Akkerman's #16 Orange Boven is more of a true orange than red-orange. Overall this is an average ink. I'm not normally crazy about oranges so this isn't one of my must-haves. However, I'm completely in love with the bottle. Disclaimer: I bought this ink myself and all pictures and opinions are my own.